I've wanted a Sandy Koufax of this particular year for as long as I can remember. I like the card design they used in 1966. 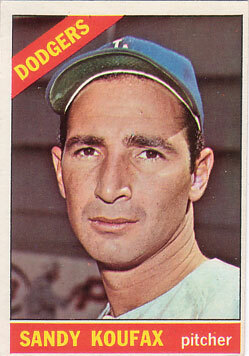 Sandy Koufax was an incredible pitcher and one of the few Jews to play in the mostly segregated major league. He quit while he was on top of his game. When I was about 9, our neighbors to the west in Redford, Michigan (they moved to suburban Houston while we lived next door to them) had a collection of baseball cards. The husband showed me some of the 1966 cards he had, and ever since, this year has been my favorite design.